What the heck is a “PGP”? “Give speaking without using any pronouns a try.” It’s not easy, is it? pronouns that an individual would like others to use when talking to or about that individual. may not use the pronouns they prefer when speaking to them or about them. within the GSA unless that person has specifically said that it’s okay to talk about elsewhere. 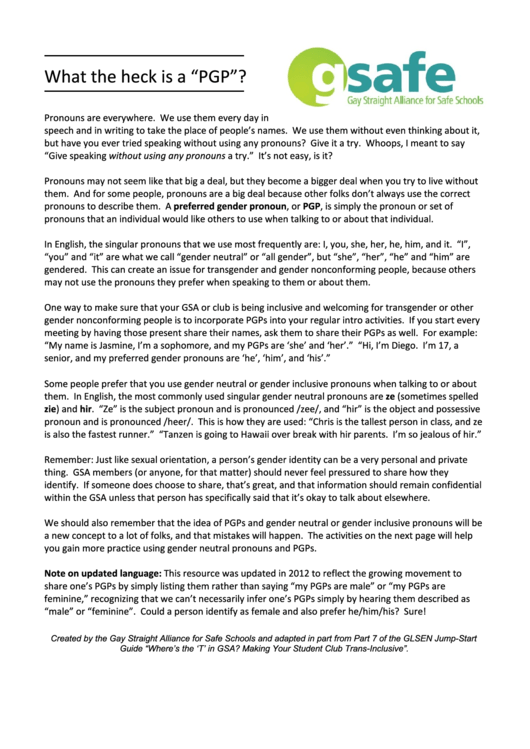 you gain more practice using gender neutral pronouns and PGPs. “male” or “feminine”. Could a person identify as female and also prefer he/him/his? Sure! Guide “Where’s the ‘T’ in GSA? Making Your Student Club Trans-Inclusive”.